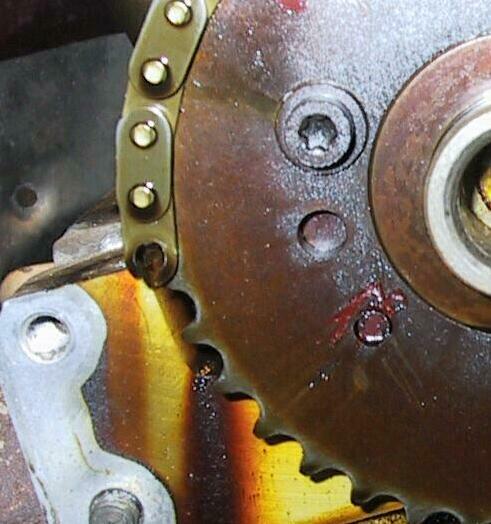 Have you had a timing chain break!? Let's have some input on chain breakages so as to get an idea of which engines are vulnerable. I have seen several at the local shop but only have had one in the family. My Dad's 420S broke one on cold startup one morning a few years back resulting in bent valves and major rework. I appreciate the reply but I sorta wanted to get an actual head count of those, such as I, that have experienced a breakage personally. It seems a great deal of opinions keep popping up on this subject and I would like to get a consolidation of actual experiences. Incidently, I doubt anyone changes their oil more often than we did on the 420S. It, still, jumped timing and broke with just over 100K on the odometer. Like a lot of other things, I usually check chain stretch every 30000 miles on customers cars. The only ones that seem to break without warning are the 380 single chains and the ones on 420s. When the stretch gets as large as 8 degrees (cam at TDC, read pointer on crank), replace chain. More stretch and the 420 chain slaps on startup cold, and bam, it's rework time. Less than 8 degrees, doesn't matter if the guides are old, they don't break. He does replace the guides when he puts a new chain in, though, as the usually don't look to good. He says he has never had any problems with this method -- he's been in the US since 1983 and has worked on MBs since he was a kid -- his dad had a taxi company. Regular oil changes make a big difference -- those metal chains wear really fast if the oil is dirty or lacks lubricating qualities. The best buy in the US is a 420 that has just had a broken chain replaced and all the related work done -- almost a new engine! I of course, had a a timing chain break last Thursday night on my '89 190E 2.6. The engine had 218k mile on it but the top end was rebuilt at about 98k. Several thousand before I bought the car. The rebuild was done by a Rolls/Mercedes dealer in Atlanta. I don't remember if they replaced the chain, and I am not able to dig up the records at this moment. But I would be suprised if they did not put a new one in. Going over the cars records, they did not seem to miss an opportunity to take some of her hard earned cash. There was I think something like 2 or 3 full brake jobs, including rotors within 30,000 miles. Anyway, the chain seems to have stretched at one of the pins and broke loose. It is not a clean break or fracture. I have not removed the lower cover yet and the chain will not come out. It seems to hang up on something at the bottom. I have not been able to determine the extent of any valve damage at this time. The cam of course does not want to move very easily, and there is not much to turn it with. I may know more tomorrow. Here again is a picture. This is the chain as I found it. It is not real clear, but perhaps you can make out the streched hole. Is there ever any damage in the bottom? I kinda have this image of a chain zipping around at about a hundred miles an hour and when it brakes it wads up down around the crank sprocket. Ever any problems down there? Don't know exactly, but I am going to find out. I tink most of the chain is intact. Just the other end that broke is caught on something. Assuming that two cylinders will have valves in the closed position. I just checked numbers 1 and 4 by using my compression gauge setup. I pulled out the check valve and screwed the adapter into the spark plug threads. Then I fired up the compresser to 60 or so lbs and attached the end of the hose to the disconnect. Then I heard the rush of air passing though the exhaust as is went past the bent valve. At least 1 and 4 are bent and I assume they all are. I don't think I heard anything pass through the intakes, but I still have the air filter and cover attached. How am I ever going to convince my wife that these are reliable cars? I had the chain break on the 300SE as I was cruising on the freeway at 110 km/p. It just happened, and the engine died while the car was gently coached to the emergency lane. Smoke blowing out for a while, and only the air-cond worked ... though not very comfortably. Got it towed to the usual MB garage and had it fixed on warranty since the chain was just changed 2 months prior. It required a head job - valves, and a new chain. I saw the chains in shambles ... bits and pieces of what was once a beautiful link. Thanks for posting this thread. I apologize for not responding as an experienced chain breaker as you requested. I also hope you recieve some replies from those with first hand experience. This is a very interesting subject for me as well. I continue to study your photograph. It's interesting the way the pin seemed to pull loose. When the engine failed did it seem to lock up all of a sudden in any way? The reason I ask is, by looking at the chain it almost makes you think that something happened to lock up the camshaft causing the chain to be "yanked loose". Only a thought, you're the one that's living through this. We are all just interested in learning from this, and want to help if we can. Michael said the chain had been recently changed, notice the color of the chains side plates. Is this possibly an inferior aftermarket chain? I just got a new aftermarket chain for my M103 and it's sideplates are the same color. I'm a little concerned. Any comments? Last year my mechanic was working on a 420sel with a jumped timing chain. He re-did the valves, guides etc and after putting the engine together and firing it up, he heard a ticking sound. He was trying to determine the nature of the ticking - when Bang - there was a loud noise and the engine was freewheeling. Upon disassembly, the new chain was broken in two places 4" apart similar to the pix above. AFTER ONLY 3 MINUTES OF RUNNING!! It was an after market chain. He rebuilt the engine again with a mercedes chain and the car is still running great. Don't know if it is co-incidence or if these after market chains are poorly constucted. My mechanic thought something had jammed in the engine but could not find a possible cause. Because the new chain has been working for over a year now - he was pretty sure it was the after market chain that was just defective. As an aside - when the after market chain broke #7 piston got damaged (don't remember how) and scored the cylinder wall resulting in the block being sent out to get a new sleeve installed. I hope to have tha harmonic balancer off tonight, then I can rotate the cam by placing the chain on both sprockets and turning the crankshaft. I'm hoping the cam will turn. If not, then we know why the chain broke. It does look to me as if the chain was pulled apart. The strange thing in the above photo is that the chain is not broken on the side where it gets pulled from the crank but from the other one (if of course I imagine the picture correctly) which undergoes much less force! The car was going about 75 mph when the chain broke. When I heard the chain break, I could swear I thought that there was a momentary slight acceleration. Maybe this was because the crank no longer had to pull the cam. After the slight hickup, the engine lost power and I coasted a long ways. Right now I'm going to put the front end up on stands so I can get at and jam the flywheel so I can get the balancer off. I was most concern when after changing the timing chain 2 months earlier, it broke on me while cruising. I was adamant that there might have been a manufacturer's defect as the chain was torn to bits. All that was left, and retrieved, were tiny metal schrapnels of not more than 1.5 cm each (roughly of half an inch). Nothing was left of that chain. Since then, I just hope that chains don't break so easily. Can anyone tell me how many links I should have on my chain? Again, it is for a 190E 2.6, the M103 engine I believe. I have retrieved the chain, and I think I may have it all. I don't know if I should try to turn the cam while it is still on the engine, or just go ahead and take the head off first. You will probably hit a piston if you turn the cam. I don't think I would try at this point, maybe just continue disassembly and repair.